Kathy Wielech Patterson’s Baltimore Chef’s Table celebrates Charm City’s restaurant revolution, from farm-to-fork fare at Fleet Street Kitchen to seasonally inspired cuisine at Liv2Eat and old standbys such as Pierpoint Restaurant (see recipes below). 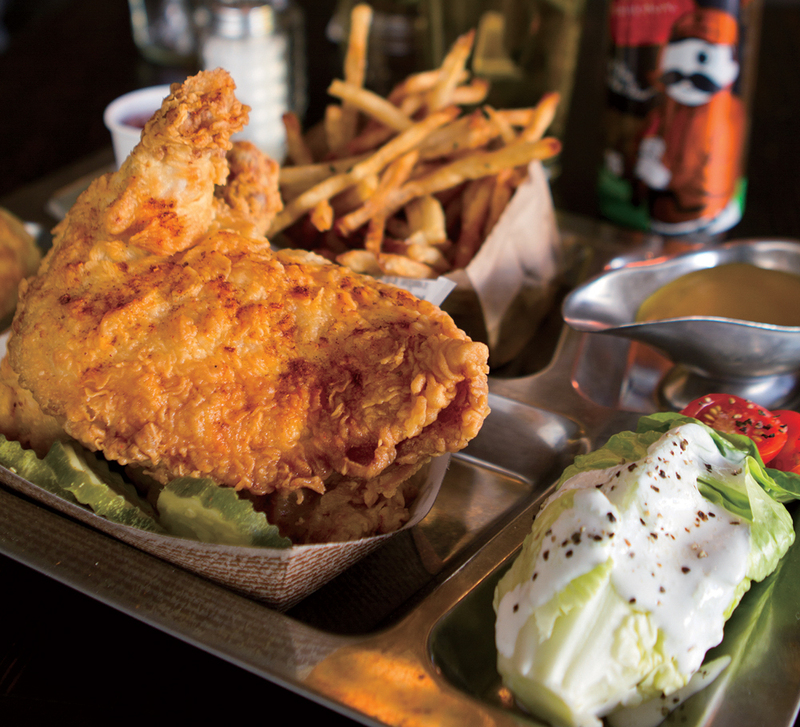 When did Baltimore become a food town? I’ve always loved eating. We had a French-club party in my high school and everyone brought something. I made riz à l’impératrice, a complicated rice pudding that I poured into my mother’s elaborate copper mold. We put it in the high-school cafeteria refrigerator, and when the day was over, I unmolded it. Everyone was impressed. Is there one person, in particular, who helped get the scene started? Cindy Wolf started it all when she opened Savannah in Fells Point. It was luxurious, yet more modern than what we were used to. Then she moved to Charleston in Harbor East and that exploded. Suddenly, there were high-end restaurants in neighborhoods where you would never have found them before. One of my favorites is the hriby dip from Ze Mean Bean Café. Whenever we go, we fight over who gets the last scrap out of the bowl—it’s pretty delicious stuff. I’ve also made Gypsy Queen’s chipotle aioli numerous times—it tastes great on everything. I want them to learn about the Baltimore restaurant scene. Even if you’re not interested in cookbooks or making the recipes, you can read about the history of the restaurants and the chefs. There’s a lot going on here food-wise. 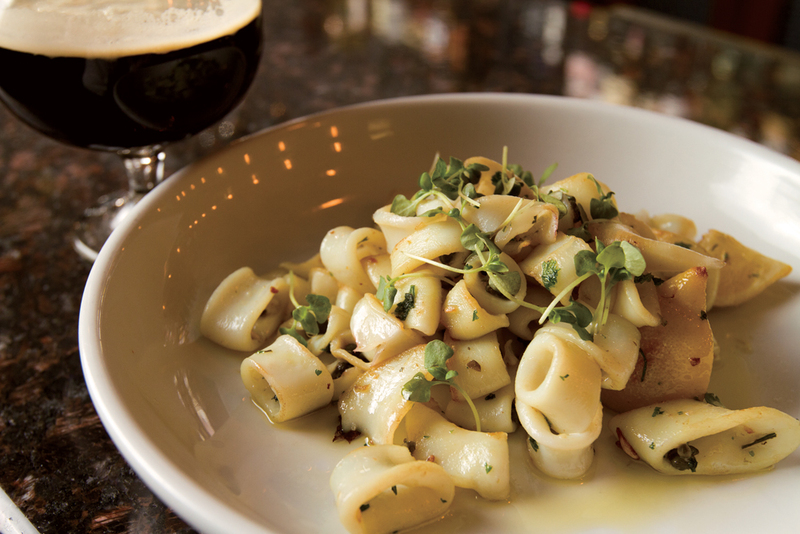 "Slow-cooking the calamari in oil makes them exquisitely tender." Preheat oven to 275°F. Place the calamari, garlic, oil blend, and salt in an ovenproof casserole. Mix well. Cover with aluminum foil and braise for 21⁄2 hours, or until the calamari are tender and soft. Remove from oven and let cool. When cool, drain off oil. Calamari can be refrigerated at this point or used immediately. When ready to serve, heat a 14-inch sauté pan over medium heat and add the extra virgin olive oil. Add the garlic and lemon and toast them in the oil. The garlic will turn light brown and start to smell nutty. Place the calamari in the pan and cook until lightly golden brown. Add the capers and parsley and, if desired, salt to taste and olive oil. Serve immediately. To make the brine: Place the water, salt, bay leaves, pepper, garlic, and thyme in a large pot with a lid. Bring the mixture to a boil, then remove the pot from the heat. Stir in the sugar and the beer. Allow to cool completely. Place the chicken pieces in the brine and refrigerate for 24 hours, or at least overnight. To make the seasoned flour: Combine all dry ingredients in a large bowl. Whisk well so there are no lumps. Transfer half of the seasoned flour to a separate large bowl. To fry the chicken: Add oil to your deep fryer according to the manufacturer’s instructions. Or add about 3 inches of oil to a deep, heavy pan with straight sides (oil should not come up more than halfway). Preheat the oil to 300°F. Remove the chicken from the brine and pat dry. Dredge a few pieces of chicken at a time in the seasoned flour. Dip them next in the buttermilk, then in the second bowl of seasoned flour. Make sure the chicken pieces are completely coated. Fry the chicken a few pieces at a time for about 12 minutes, or until the chicken floats. Do not crowd the pan, or the oil will cool down and the chicken will be greasy. Remove the cooked chicken to paper-towel-lined plates to drain. 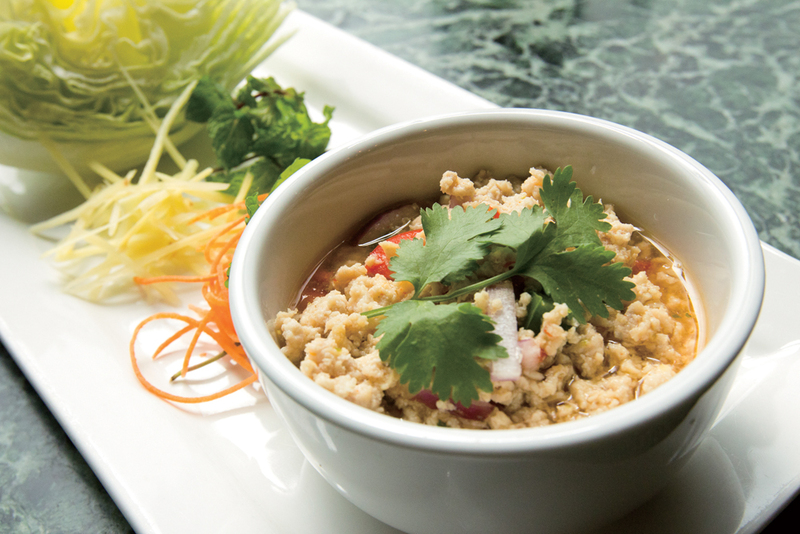 Despite their deceptively small size, Thai chiles are very hot. Use fewer if you prefer a milder dish. Cook the ground chicken in the oil, breaking up the meat into small pieces with a wooden spoon, until cooked through and no longer pink. Remove the chicken to a bowl. Combine the chiles, cilantro, garlic, sugar, fish sauce, and lime juice in a blender and puree. When the chicken has cooled, add the carrot, onion, and bell pepper. Pour the sauce over and mix well to coat the chicken and vegetables. Transfer the mixture to a serving bowl. Cut the lettuce into quarters. Arrange on a serving plate with the bowl of chicken. Present so the diners can tear off leaves of lettuce, place a spoonful of the chicken mixture in the center of each, and fold the lettuce around it. 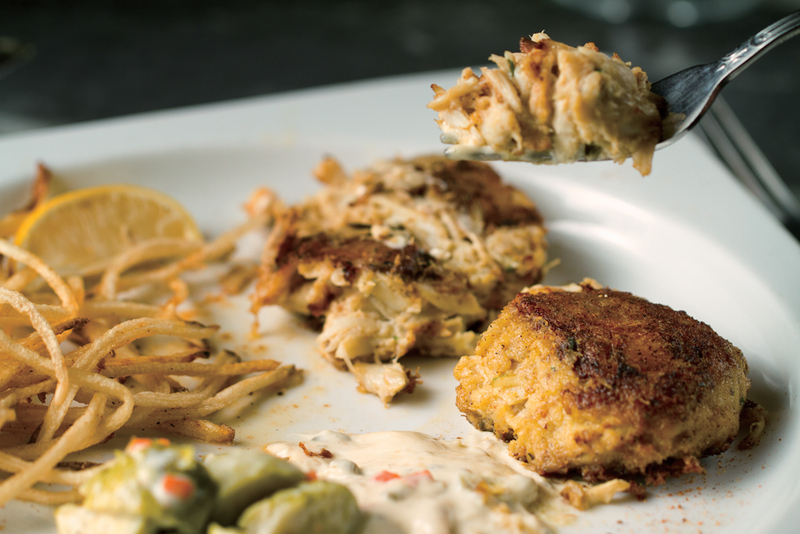 Chef Nancy Longo makes her famous crab cakes two ways: traditionally, with simply steamed crabmeat, or not-so-traditionally, with lightly smoked crab. The method for smoking the crab follows the recipe. We like them either way. To make the crab cakes: Pick through the crabmeat for bits of shell, being careful not to break up the lumps. Set aside. Combine all of the remaining ingredients in the order listed and mix thoroughly. Add the crabmeat and gently fold in so as not to break the lumps. Form into eight approximately 4-ounce cakes. The crab cakes can be cooked either of two ways: Broil in a heated broiler in a shallow baking dish with a small amount of water for about 10 minutes, being careful not to burn them, or sauté in vegetable oil until golden brown on all sides. To smoke the crabmeat: Soak a few fruitwood chips in a bowl of water for approximately 1 hour. While the chips are soaking, prepare a bed of hot gray coals in a charcoal grill that has a lid. Place a small stainless steel bowl of water in the coals in the center of the grill. Remove the wet wood chips from the water and gently drop them on top of the hot coals, which will cause them to smoke. Wrap the grill grate with a sheet of aluminum foil. Poke a few small holes in the foil, put the crabmeat on top, and set the grate in place on the grill. Cover the grill and allow the crab to smoke for approximately 30 minutes. Remove the crabmeat from the grill and allow to cool for 1 hour. Use in the crab cake recipe in the same manner as for plain crabmeat. Preheat oven to 350°F. Pour the lobster stock into a saucepan. Reduce to one-quarter of its original volume over medium heat. Add the heavy cream and reduce more. Add the cheeses and stir. Add the lobster pieces and salt and pepper to taste. 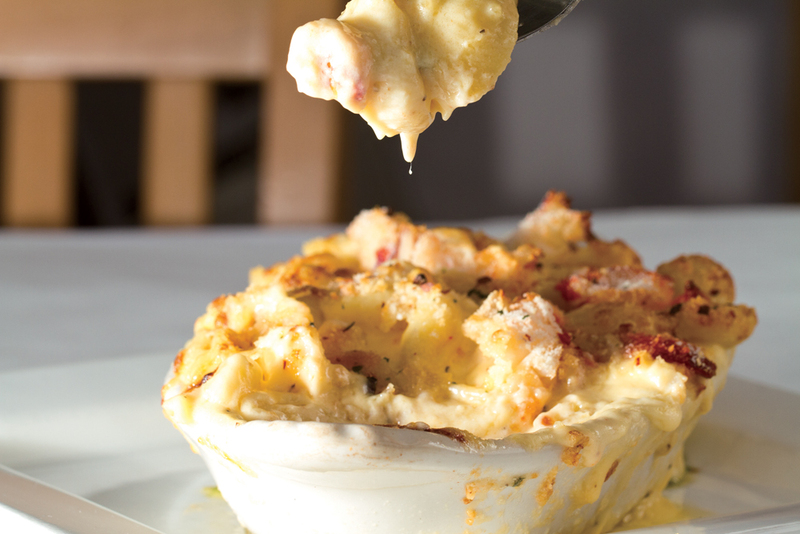 Combine the cooked pasta with the cheese-lobster sauce in an oven-safe dish. Top with bread crumbs and bake until golden brown, approximately 5-8 minutes.